Watch the Billy Rocks featurette at http://youtu.be/K-y0mojDOz8 and Jack Horne at https://youtu.be/3-utnlU59GU. 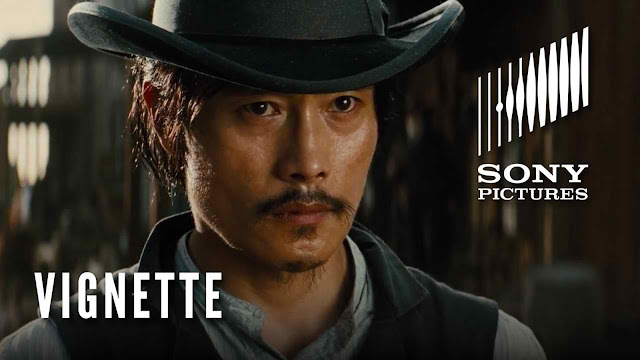 Korean actor Byung-Hun Lee plays Billy Rocks, an assassin who shows expertise with knives and close combat. There’s a history of Asian immigrants in the western frontier, though none had the resources to become badass outlaws like Billy Rocks due to their restricted labor to the railroads and laundry services. Meanwhile, Vincent D’Onofrio plays Jack Horne, a master trapper and tracker. They are joined in the film by the Bounty Hunter (Denzel Washington), the Gambler (Chris Pratt), the Sharpshooter (Ethan Hawke), the Outlaw (Manuel Garcia-Rulfo) and the Warrior (Martin Sensmeier).